No, your eyes are not deceiving you, the baby lizard is now trapped in the window. I saw him outside climbing the window screen, said, "hello" and watched it for a bit. 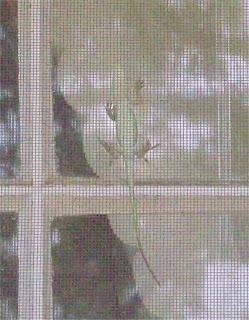 I then watched it climb between the screen and the window. That is when I saw that the one side of the screen was not in properly. I tossed off my muddy Crocs and flew through the house to close the bathroom window. The last thing I wanted was for the lizard to be inside scuttling around the house. We had that issue about five years ago, not fun. Lizards are cute and fun to watch when they are outside but not in the house. So, now, we need to figure out a way to pop the screen so it can get back out without opening the window too wide.